Successfully Added PIPE 628 Automatic 6-In-1 Vape Mod Kit - 350mAh Battery, 2ml Tank, Authentic Pipe Design, 510 Thread to your Shopping Cart. To all vapers out there who like to enjoy their relaxing vaping sessions in style, we introduce you the PIPE 628 Automatic 6-in-1 vape mod kit. Featuring the shape of a classic pipe, this vaper allows you to look apart and grab the attention of all people standing by while enjoying your upcoming vapes. Crafted out of durable and stylish resin, PVC, and brass material – this vaper pipe features a high-end and stylish design that is guaranteed to turn some heads. Simply fill up the tank of this beautiful vaporizer with your favorite taste of e-liquid and you’ll be all set to enjoy countless relaxing vaping sessions to come. 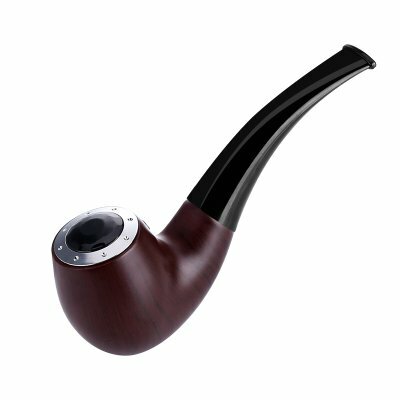 Perfect for all the classic pipe smokers out there that like to make the switch from harmful tobacco products to the healthier option of vaping – this amazing pipe-shaped E-cigarette offers the ultimate solution. With this beautiful E-cig you will be able to leave behind those harmful and old school pipes and replace them with a vaper while, at the same time, still keeping the feeling as if you were holding a traditional pipe. Thanks to the latest vaping technology, the PIPE 628 E-cigarette even produces traditional and realistic pipe smoke effects, giving you the experience as if you were smoking a traditional pipe. Packing a sophisticated 2ml tank, this beautiful E-cigarette allows you to fill it up with a sufficient amount of your favorite tasting e-liquid. Along with a decent atomizer resistance, this vaper is capable of handling quite some Wattage through which it provides a tasteful and powerful vaping experience to beginning and experienced vapers alike. Added to that, this vaper comes with a 510 thread connection that offers countless of options to fully enhance your vaping experience. In order to allow you to take the absolute most out of this vaporizer pipe, this E-cigarette furthermore features a lightweight 350mAh battery that provides you with enough power to get through multiple vaping sessions without you needing to worry about running out of juice. The PIPE 628 Automatic 6-in-1 vape mod kit comes with a 12 months warranty, brought to you by the leader in electronic devices as well as wholesale electronic gadgets..